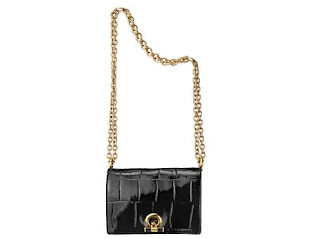 When I think of a handbag with chain handles, the classic picture I envision in my head is that of an evening bag. Well, that’s no longer the case. Chain handles are showing up on a variety of silhouettes and appearing in more than one color (the classic chain look is silver). These handles give your bag a touch of elegance, and with the new emerging silhouettes, the handbags they accompany can be worn casually, out for a night on the town, and to a formal event. Check out a couple of the styles below. 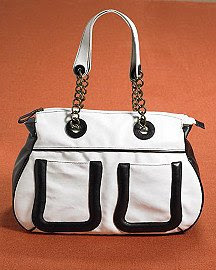 This is a beautifully structured bag. It has a nice infusion of casual and elegant chic. 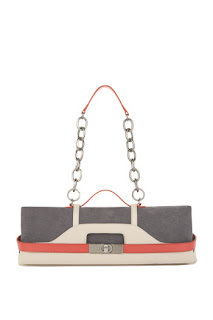 This bag will be great in a more laid back setting. I love the short handle. 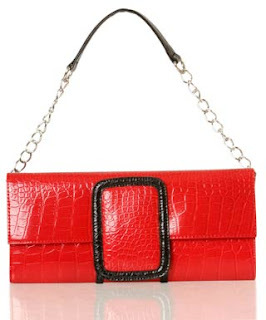 I love the fire engine red on this faux-croc purse. I would love to have this purse for a special occasion. It's super sleek. What a great carrying bag. I could fit all my usual items in it. I really love the first chained bag. A.W.